Much of this post is US-centric. It’s where I live, and 19th century America is one of my historic interest areas. However, the generalities still apply. Know what types of wheat were prevalent at the time and place of your recipes if you want them to turn out correctly. For our purposes, we will be talking about two general classifications, hard vs. soft wheat. Soft wheats are lower in protein. They produce soft crumb breads, and light flaky pastries. Breads made with soft wheat are essential in many early recipes that use bread or bread crumbs as thickeners or to make pastes for batters. Most early American wheat types are soft wheat. Soft wheat grows in cooler areas, and so was well-adapted to the Eastern United States. Soft wheat was the predominant type through the late 19th Century. Hard wheats are significantly higher in protein than soft wheats, with hard spring wheat having the highest protein content. Hard Red wheat was introduced to the “wheat belt” of America by Russian Mennonites between 1874 and 1884. The Mennonites, who settled in Kansas in the late 1800’s, brought with them seeds of Turkey Red Wheat, a hard winter wheat. Red Fife was another type of hard wheat, also introduced in the 19th century. Prior to the late 19th century, the Americas and Europe were most probably using flour from soft wheat. This has a dramatic effect on breads, and recipes that use bread or breadcrumbs as ingredients. In my early days of cooking historic recipes, those that used bread or breadcrumbs as thickeners just did not work out well. When you wet down bread made with high-gluten flours (hard wheat), you just end up with soggy bread. When you wet down bread made with low-gluten flours (soft wheat), it turns to a mushy paste. And that is exactly what those recipes intend. Now I make my bread for historic recipes using soft wheat flours, and they come out much closer to what is described. So, where do you get soft wheat flour? One of the best known soft wheat general purpose flours in the US is White Lily. If you’re east of the Mississippi, you may have no trouble finding it in stores. If not, well, there’s mail/internet ordering. You can also look for pastry flour, though depending on the source, that may be expensive. Or, you can purchase heritage flours. These are two mills I know of, Hayden Flour Mills in Arizona, and Anson Mills in South Carolina. Hayden Mills carries White Sonora, a variety introduced in Central America in the 17th Century, reaching what is now the southwest US in the 18th Century. They also carry a bread flour made from Red Fife, an early hard wheat introduced in the 19th Century. Anson Mills also carries Red Fife, as well as flour made from Red May wheat, a soft wheat that goes back to American colonial days. They also carry a wide variety of other historic flours and grains. If you are really interested in wheat classifications, the earliest US-based report I know of is “Classification of American Wheat Varieties”, published by the USDA in 1922. Some history, and a lot of descriptive information on the types of wheat grown in the US at the time. And yes, we’ll be talking about gluten, but not relating to gluten-free, etc. What we’re talking about is how gluten/protein content affects your baking, and what the difference was in historically available wheats/flours. And, just to get this off my chest, the biggest lie in modern baking is “All Purpose” flour. It’s not, there’s no such thing. What these should be labelled as is “General Purpose” flour. For reference, more protein equals more gluten. Gluten is a protein. Gluten is what makes a dough “strong”. High gluten flours make stretchy, strong doughs needed for free-standing loaves, pizza crusts, etc. If you are using yeast, you probably want a high-gluten flour. Low gluten flours are needed for light, delicate things. If you are using baking powder/baking soda, you probably want a low to mid gluten content flour. Now for the numbers. Generally, basic wheat flours are going to run a range from 5 to 14% protein content. * From 5-8% are your cake flours. These are VERY low gluten, to give very light cakes. Also may be milled finer. This is what you want for super-light angel food cakes, etc. * From 8-9% protein are the pastry flours. Enough gluten to hold together a light dough, low enough to make the finished product very light and flaky. * From 12% and higher protein are the bread flours. Made from hard wheat, they have high gluten content to allow the bread to hold together while rising. You really cannot make really good free-standing loaves like french breads without it. And now, “All Purpose”, which I have seen defined as 10-12% protein, but actually found in the range of 8-12%. Seriously, that covers a lot of ground. In the case of one of my favorites, King Arthur All Purpose has a protein content of 11.7%. That means it is very close to bread flour. And, it really does turn out nice yeast breads. Enough so that I don’t usually bother buying Bread Flour. The flip side is that it makes poor biscuits, pie crusts, etc. And cookies, biscotti, muffins, etc are sometimes kind of marginal. After getting tired of my biscuits being hockey pucks, in spite of recipes claiming “light and fluffy,” I decided maybe the Southern cooks I was getting my biscuit recipes from had an unfair advantage. So I ordered a bag of White Lily flour. Yeah, they really do have an unfair advantage. White Lily All Purpose flour is made from soft wheat, and has only 8% protein content. All of a sudden, my biscuits were reaching for the sky, and my pie crusts would flake to the lightest touch. 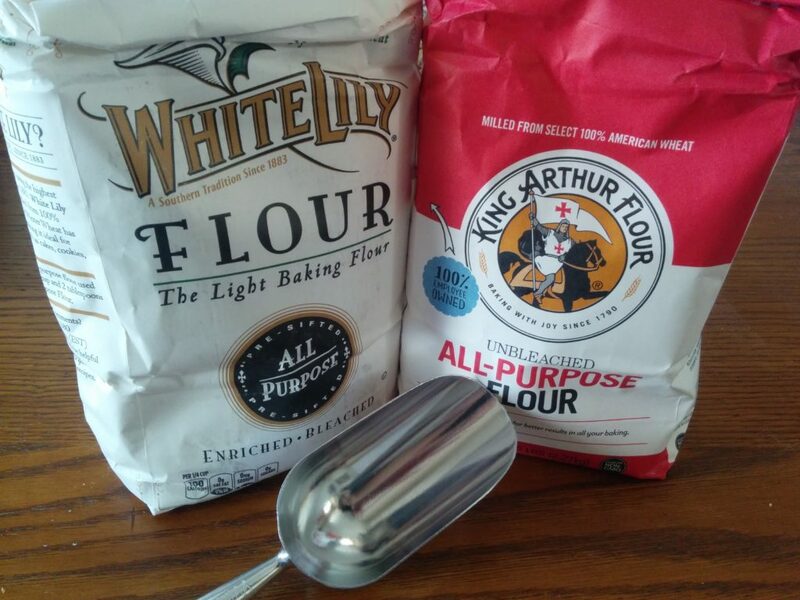 So you can see that while King Arthur “All Purpose” is practically bread flour, White Lily “All Purpose” is really pastry flour. For a fun comparison, White Lily bread flour is also 11.7% protein content, exactly the same as King Arthur all purpose. Note that the type and protein content of flour varies by region. US flours tend to use more hard wheat. UK flours typically use more soft wheat. Know your flour. S. Dakota Wheat Commission , “History of Wheat,” iGrow | SDSU Extension. [Online]. Available: http://igrow.org/agronomy/wheat/history-of-wheat/. [Accessed: 04-Aug-2017]. “Flour 101,” Food Network. [Online]. Available: http://www.foodnetwork.com/recipes/packages/baking-guide/flour-101-guide-to-different-types-and-uses.html. [Accessed: 04-Aug-2017]. “Bread Flours: Baking Characteristics,” The Artisan. [Online]. Available: http://www.theartisan.net/flour_test.htm. [Accessed: 04-Aug-2017]. “Flour – A Treatise,” The Artisan. [Online]. Available: http://www.theartisan.net/Flours_One.htm. [Accessed: 04-Aug-2017].